Two hundred years ago Sutton still had extensive commons. 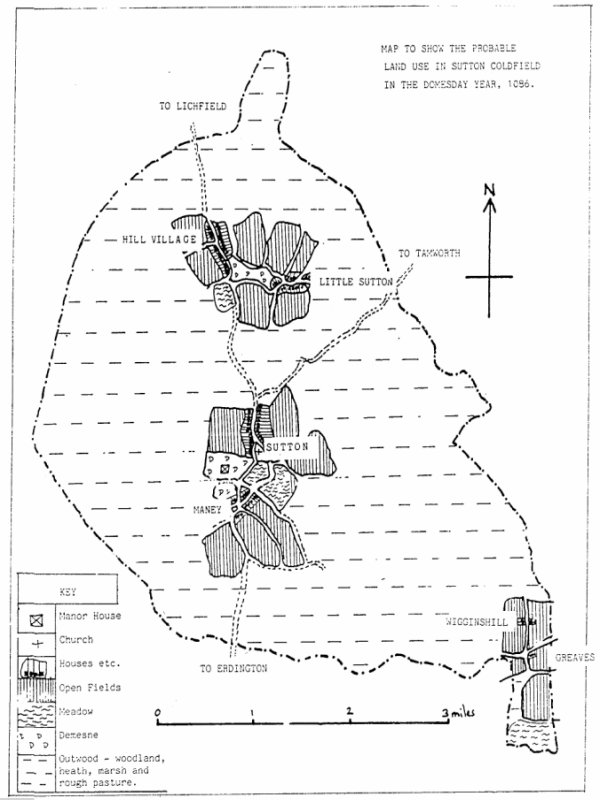 The area of Sutton was approximately 13,000 acres; of these, 7,300 acres belonged to private owners, Sutton Park accounted for 2,400 acres, the remaining 3,300 being open commons, uncultivated land where there were no fences, generally having poor soil, with rough grassland with tracts of gorse and heather. The largest expanse of common, then called the Coldfield, covered what is now Boldmere, and a huge swathe of commons swept round the north of the town from Four Oaks to Roughley. To the east the commons were interspersed with cultivated land, each stretch of common having its individual name, such as Withy Hill, Whorwoods Field, or Echelhurst. The commons had been even more extensive in the past. The Domesday Book of 1086 records only about 2,000 acres of Sutton being under cultivation with perhaps another 2,000 acres of managed woodland, the remainder being “outwood”, wild country sometimes known as bush. This wild country was nevertheless regulated - it was subject to forest law, Sutton lying within the forest of Cannock at the time - there were severe penalties for poaching the game animals. Great inroads were made into the outwood after 1086, first by the creation of Sutton Park in about 1100, and then by bringing waste land into cultivation over the next two centuries. A clearance made in 1252 was described as “In bosco de Sutton” - in the Sutton bush; such clearances were made by permission of the Earl of Warwick in his capacity as Lord of Sutton Chase, and were to his advantage as Lord of the Manor of Sutton. The Sutton Court Leet dealt with any offences against the customary duties or against the rules of the Chase. The town Charter of 1528 did away with the lord of the manor and the lord of the chase, and thereafter the commons were administered by the Warden and Society. Population was increasing and, year by year, encroachments slowly reduced their acreage. More people exercising their rights over smaller commons required careful regulation, and this was done by the ordinances of the Court Leet, effectively bye-laws. A court of 1764 issued seventeen such bye-laws, fourteen of them relating to the Park and commons. Overgrazing was a problem, so cottagers were limited to fifteen sheep and servants to six; anyone allowing the sheep of “out-parishioners” onto the commons would be fined ten shillings, with a reward of half a crown to the informant. The commons and park supplied copious kids - bundles of sticks and gorse for kindling - but anyone supplying kids to an out-parishioner faced a fine of ten shillings. Population continued to increase, and the commons to shrink, but it was not until 1824 that the dreaded Enclosure Act deprived the poor people of Sutton their rights of common - the commons became private property, everybody who already owned property in Sutton receiving a share. Schematic map of Sutton in 1086 - the lines of dashes indicate outwood or bush country. 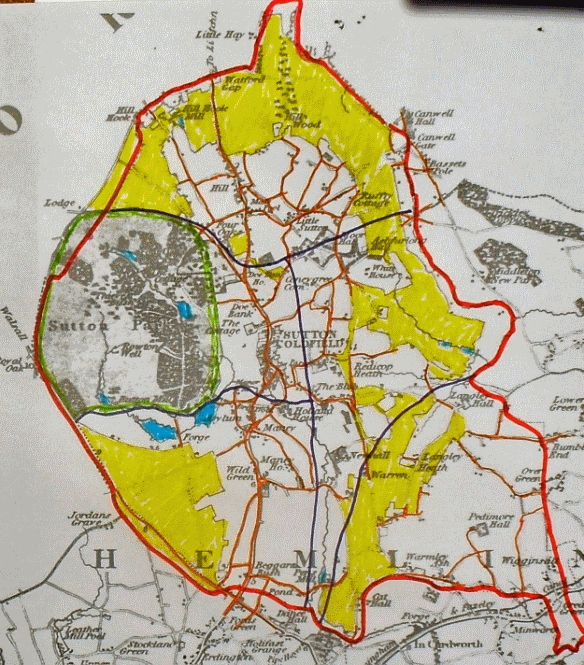 Map of Sutton in 1790 - the commons are coloured yellow.